Christmas came slightly early this year for Mac enthusiasts, with significant product announcements, including new dual-core, dual-processor Power Mac G5s. But just what do the new high-spec computers mean for musicians? Ever since Apple announced the transition to Intel processors earlier in the year, there's been a great deal of speculation concerning what would happen to the company's Pro line of Macintosh computers, namely the Power Mac and Power Book. Would Pro customers have to wait until the middle of next year to see a significant leap forward in Mac architecture, when Intel-based Macs are scheduled to begin shipping? Or would Apple integrate newer Power PC processors and technology into these products to keep Pro customers happy — and, perhaps more importantly, keep them buying new Macs? If you've read anything in the technology or computer press recently, you can't fail to have heard about dual-core processors. A dual-core processor basically combines two independent processor cores and caches on a single chip, giving you pretty much the performance of a dual-processor system in a computer with only one physical processor chip. Of course, Apple, like many other computer companies, have been supplying systems with two processor cores on separate chips for some time, so you might be wondering what the big deal about having the two cores on one chip is. Indeed, for two-core systems, there isn't much difference. Where this is a big deal is for dual-processor systems where each processor is also dual-core: suddenly you double the number of available processor cores again, to four, and this gives a huge performance boost to applications written to take advantage of multiple processor cores. AMD have been making a great deal of noise about their dual-core, dual-processor capable Opterons this year, and Intel had just released dual-core, dual-processor-capable Xeon processors as I was writing this article. Both companies had been shipping dual-core, single-processor chips for most of this year already. IBM's Power PC 970 processor is better known to Mac users as the Power PC G5, and after IBM announced the dual-core 970MP processor earlier in the year, many people speculated as to whether dual-core Power Macs were also on the horizon, incorporating these new chips. Accordingly, on October 19th at an Apple Special Event in New York, the day before the Photo Plus Expo, Apple VP David Moody unveiled a new range of three dual-core Power Macs. The first two models feature single-processor, dual-core configurations at 2GHz and 2.3GHz, priced at £1399 and £1749 respectively, while the new high-end model offers a dual-processor, dual-core system at 2.5GHz for £2299. However, rather than simply replacing the previous single-core models with dual-core processors, the new dual-core line-up represents perhaps the biggest architectural change to the Power Mac G5 since its original release over two years ago. Compared to the previous generation of Power Macs, the new models offer a 1MB L2 cache per processor instead of 512k (although on a per-core basis this is basically the same). The new Power Macs support 533MHz DDR2 memory (PC2-4200), whereas previous models supported 400MHz DDR (PC-3200) memory, although all models still come with 512MB RAM as the standard configuration, which is perhaps a little low for the quad-core model. On the plus side, though, you can now expand the memory of each Power Mac to 16GB (as opposed to 8GB in previous models), which should be pretty exciting once more samplers and other music programs begin to make greater use of 64-bit memory addressing. The low-end Power Mac has a 160GB 7200RPM SATA drive, while the other two models have a 250GB drive, and all models feature a dual-layer compatible 16-speed Super Drive. This is all the same as before, and the connectivity is also pretty similar, with the Power Mac G5 offering one Firewire 800 port; two Firewire 400 ports (one on the front and one on the back); four USB 2 ports (one on the front and three on the back, which is one more than before); two USB 1.1 ports on the keyboard (a shame, because a USB 2.0-compatible hub in the keyboard would be nice); and optical and analogue audio input and output ports. Apple also supply a Mighty Mouse as standard now, instead of the older Apple Pro Mouse. For networking, Bluetooth 2+EDR (Enhanced Data Rate) and Airport Extreme are build-to-order options, and one particularly welcome change is the inclusion of a second Gigabit Ethernet port. In addition to simply providing more network bandwidth, this could also come in handy for connecting Ethernet-based control surfaces to your Mac at the same time as a general data network, preventing the control surface packets from being scheduled in amongst a data load. As is often the case with new Power Macs, one of the most drastic architectural changes concerns expansion slots. Instead of AGP, PCI or PCI-X, as featured in previous Power Macs, Apple have instead completely adopted the newer PCI Express standard for graphics and all other expansion cards. Whereas PCI-X (as used in the original Power Mac G5) was an evolution of PCI (Peripheral Component Interconnect), offering backwards compatibility with PCI in terms of both hardware and software, PCI Express is a completely new hardware implementation that uses a high-speed, 2.5GB/s serial transmission and has a level of software compatibility with the original PCI-buss architecture. What all of this means is that you can't use any existing PCI or PCI-X cards in the new Power Macs, which also means that anyone with such an audio card or DSP accelerator is going to be out of luck. This could affect Pro Tools users most significantly, since it makes it impossible to run Pro Tools HD on a new Power Mac G5, whereas at least there are USB or Firewire solutions for Pro Tools LE and other music and audio software, such as Logic, Cubase and Digital Performer. It is, perhaps, a shame that Apple didn't opt to use PCI Express for the graphics, with one other PCI Express slot for expansion, alongside two PCI-X slots: a mixture of PCI Express and PCI-X slots has been pretty common this year in the Intel and AMD world, for example. This could have been useful for musicians, since there are currently no PCI Express audio or DSP cards (specifically for music and audio) on the market. On the other hand, a move to an all-PCI Express system is inevitable in the coming year for all computer platforms [see our audio interface manufacturers' round table feature starting on page 130 of this issue], so both users and developers are going to have to migrate at some point. 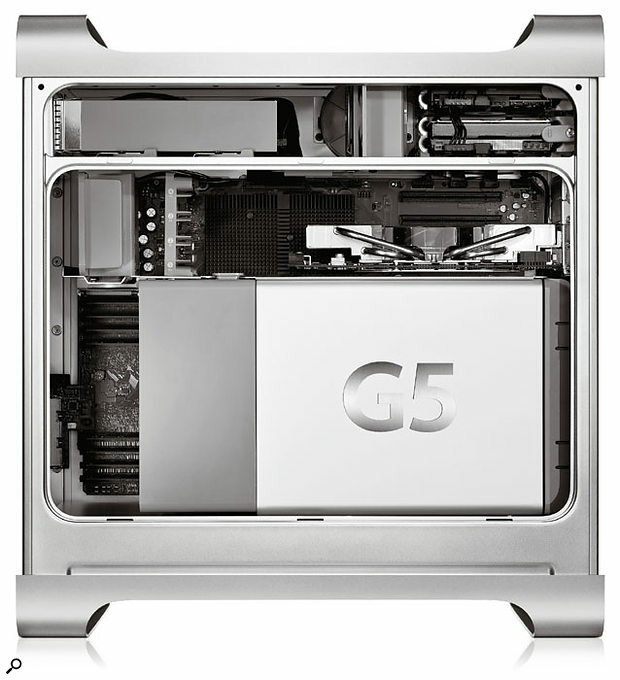 Fortunately, given the music and audio world's reliance on PCI-based hardware at the moment, Apple have decided to keep the previous high-end model of the last generation of G5s in its product inventory. So you can still buy a single-core, dual-2.7GHz Power Mac G5 at a reduced price of £1949. The graphics cards supplied in the new Power Macs have also been updated with an all-Nvidia line-up, offering one single-link DVI port and one dual-link DVI port (for a 30-inch display) as standard, meaning that every Mac now supports one 30-inch display straight out of the box. The entry-level model features a Geforce 6600LE card with 128MB of video memory, while the other two models include a full Geforce 6600 card with 256MB memory. Two other build-to-order Nvidia graphics cards are also available: the 7800GT, featuring 256MB memory, which offers increased memory bandwidth with a 256-bit memory interface (the standard cards have a 128-bit interface), and the Quadro FX 4500, which features 512MB memory, a 256-bit memory interface, two dual-link DVI ports (for connecting two 30-inch displays simultaneously) and a stereo 3D graphics port that enables 3D goggles to be attached to the Mac, for those working with advanced visualisations. Probably not too useful for just tweaking plug-ins! The 4500 costs around an extra £1100, but pricing for the 7800GT wasn't available as this article went to press. The New iPod: Must Be Seen? 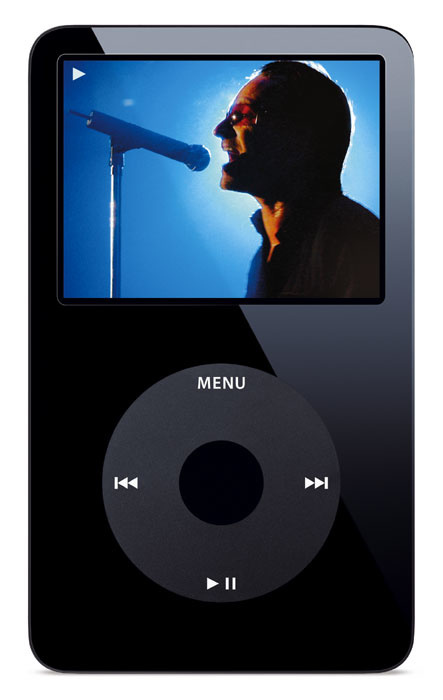 Like the iPod Nano, the new video-capable iPod is also available in black. Unlike the Nano, the new iPod features up to a 60GB hard drive, with battery life of 20 hours when playing back music.Photo: AppleA brand-new, video-capable iPod was announced by Apple CEO Steve Jobs at another 'Special Event' the week before the new Power Macs and Powerbooks were revealed. The new iPod replaces the previous iPod, formerly known as the iPod Photo, and, in addition to being thinner than the previous generation, offers a 320 x 240 colour display for watching MPEG-4 and H.264 video. In terms of video content for actually watching on your iPod, Apple are now selling music videos from the iTunes Music Store, although the real highlight, at least for US-based iPod owners, is the deal Apple have struck with Disney/ABC to offer five TV shows for purchasing via the iTunes Music store. You can now download episodes of Lost, Desperate Housewives, Night Stalker, The Suite Life and That's So Raven for $1.99 each. In addition to previous seasons being available to purchase, the latest episode will always be available for purchase and download the day after it has been broadcast. The new iPod is available in a 30GB model for £219, with a 60GB version costing £299. Both models are available in black or white. Unveiling the new Power Macs ahead of the Photo Plus Expo was only part of the news from the most recent Apple Special Event, and the big reason for holding this event before a major photography show was to announce Aperture, a new pro application aimed at improving the workflow of photographers, especially those working with RAW-format images, that costs £349 and will be released in November. However, Apple also revamped the somewhat ageing Powerbook line. Battery life has been improved to approximately five hours in the 12-inch Powerbook and 5.5 hours in the 15- and 17-inch models. Perhaps more significantly, the 15- and 17-inch models have new displays with improved resolution. The 15-inch goes from 1280 x 854 to 1440 x 900 (the same resolution as the old 17-inch Powerbook display), and the new 17-inch Powerbook offers 1680 x 1050 pixels (the same resolution as the current 20-inch Cinema Display). All 12-, 15- and 17-inch Powerbooks now feature an eight-speed Super Drive as standard and the 15-inch and 17-inch models now offer dual-layer support as well. The 15-inch model has also been upgraded to offer a dual-link DVI port as standard. Other specifications remain unchanged from the previous line-up. The 12-, 15- and 17-inch Powerbooks retail for £1099, £1399 and £1749 respectively. Apple also unveiled new iMac models this month alongside the new iPod (see box, left). The new iMac is thinner, includes a built-in iSight camera for using iChat AV, and offers a new feature called Front Row, which includes a small remote control enabling you to use the iMac's media functionality (iTunes, iMovie, playing DVDs and so on...) from your armchair, via a brand new interface. This is Apple's first attempt at competing with Microsoft's Windows Media Center products and it will be interesting to see how this direction is developed. The new iMacs feature 512MB 533MHz DDR2 memory and use PCI Express for graphics, with an ATI X600XT offering 128MB video memory. They come with a Mighty Mouse and both the 17- and 20-inch models now provide an eight-speed dual-layer Super Drive as standard. The 17-inch model has a 1.9GHz G5 processor and retails for £899, while the 20-inch model has a 2.1GHz G5 processor and costs £1199.